During the Ming Dynasty one of the royal guards, Feng San brutally rapes and murders one of the princesses. The emperor in his royal wisdom gives another chance to Feng Sau who he believes let this travesty happen when the criminal San escaped. Feng Sau chases Feng San to a mystical spinning Buddha wheel, after attempting a ritual they mystically both end up 300 years into the future. 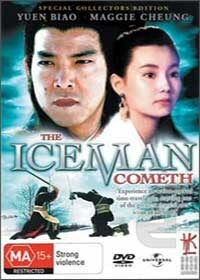 Iceman Cometh is a Kung Fu movie that mixes old style mystical kung fu with a modern day setting. Yuen Biao plays the lead role in this movie with his masterful acting that truly makes this one of the best Kung Fu movies of the 80s by using a time travel setting story that was actually quite interesting. This is one of the few movies with ancient kung fu warriors in a modern day setting that is simple to follow but unfortunately holds no true surprises. The movie starts to drag on a bit when the modern day jokes start to become old during the second half of the movie but when the villain returns, the action picks up with some spectacular stunts and amazing car chase and gun fight scenes. The last fight lasts some 10 to 15 minutes which is incredible. With that said, the choreography and acting is first class!